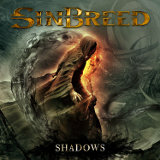 Semi-supergroup Sinbreed's new album, Shadows, is not exactly an unpredictable album. With luminaries from the power metal world such as Blind Guardian's Fredrik Ehmke on drums Seventh Avenue's Herbie Langhans on vocals, one has a fairly good idea of what is coming in this album, especially since another Blind Guardian member, Marcus Siepan, has joined the band this time around. While it isn't about to surprise the listener, it makes up for that by being a solid album containing a few weaknesses, with a sound in true German speed metal style that picks up in many ways right where Seventh Avenue left off. That's the best way to describe it. The fast-chugging gallop of Bleed is instantly familiar, with enough rough choppiness in the guitar on the verses to prevent the smoother choruses from taming it too much, though the solo isn't as spectacular as one would expect. Call to Arms is harder-driving and has a little more of a solo, but not as much melody as one would hope for. The strongest thing on this album is definitely Langhans' vocals, which are a treat to hear. The man has a voice custom-made for power metal: Rough but heroic-sounding, low but able to reach an effortless falsetto scream any time, he does best when his singing is wound around a strong melody, and on the verses of Reborn and Leaving the Road, which give him a chance to stretch his vocal chords a bit, it's easy to see why so many complete atheists were happy to listen to Seventh Avenue. Note to any who weren't happy to do so: Sinbreed's not a Christian metal band, though there is the amount of religious imagery one would expect from a secular power metal band. Leaving the Road is probably one of the best songs on the album, and not just because of Langhans' ability to scream, but because of the superior melody and general feeling of enthusiasm in the guitar work on here. The lack of a good melody on some of the other songs, though, is a problem that never quite goes away. Though speed and heaviness are in abundance courtesy of the all-star cast and guitarist/band leader Flo Laurin, power metal songs live and die by good melodies, and most of the time, these aren't. Case in point: Far Too Long and Black Death, which both gallop along at breakneck pace, but don't ever provide much melodic difference between the two -- or even internally. Many of Blind Guardian's songs were co-written by Siepan, and Seventh Avenue's songwriting, for all its messiness, was incredibly catchy, so why this slavish insistence on safe, anonymous melodies? Broken Wings somewhat breaks this trend, by supplying a longer, more anthemic chorus and a neat little harmonized guitar solo, as well as an acoustic ending to counter all the heaviness, and the precision of the rhythm guitar work on London Moon is quite enjoyable, but the refusal to differentiate the songs a little, combined with the smooth production job, does make some of the songs bleed together. The album ends on a high note -- Standing Tall is the most Seventh-Avenue-esque track, with a defiant theme and a verse with short a capella parts by Langhans --, and it should be noted that the melodic shortcomings on the album often get covered over by the band's superb and precise musicianship. Shadows isn't the most original piece of power metal to come out, and it's a bit of a downer that such a dream team couldn't come up with catchier songs, but this is still a good album to listen to, especially if, like myself, one has been wishing for more of Langhans' singing. This is a decent-quality release that may have stronger successors if Sinbreed can improve their hooks.